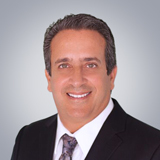 Angel Benmaman, DDS, has been practicing dentistry since 1991. He provides preventive, restorative, and cosmetic dental services including dental exams and cleanings, fillings, extractions, root canal therapy, crowns, bridges, dentures, gum disease management, veneers, teeth whitening, and mouthguards. His team also strives to provide same-day emergency dental exams whenever possible. Dr. Benmaman is fluent in English and Spanish. He earned his Bachelor of Science degree in Biology from Interamerican University in Puerto Rico and earned his Doctor of Dental Surgery degree from Georgetown University School of Dentistry in Washington, DC. He keeps current on new technology and techniques by attending continuing education seminars, including several offered by the American Dental Association. Dr. Benmaman provides dental services to adults, teenagers, and children as young as nine years old. When he's not fixing smiles, he enjoys playing basketball and volunteering in his community.